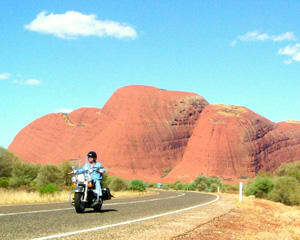 If you can't decide between Ayers Rock and the Olgas this Harley tour is for you! You will see it all in 2.5 hours, on the back of a legendary Harley Davidson. Perfect for people with limited time, or those who just want to see it all! In 2.5 hours you will experience awesome close-up and panoramic views of both Ayers Rock and the Olgas, from the back of a legendary Harley Davidson. You will be taken out the Olgas/Kata Tjuta dating back 500 million years, stopping at the lookout before continuing on to the Olga Gorge. On the way back you will witness the majesty of Ayers Rock/Uluru with stop for the perfect photo on the way. Choose to be picked up and dropped off from either the Airport or your Ayers Rock Resort. This tour is ideal for those in transit awaiting flights. We operate four late model Harley Davidson Heritage Softails, and over the last 18 years have clocked up over 3.6 million kilometres on the 18 Harleys that have come and gone in that time. Perfect weather conditions for motorcycle riding combined with barely any traffic and stunning natural scenery make this a completely unmissable Australian experience. Due to extreme heat during the months of November - March inclusive, rides can be booked for sunrise through to 10:00 AM, and 5:00 PM through to sunset.